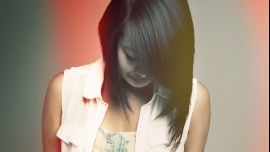 AILEEN is a singer, musician, and (recent) music producer from Los Angeles. She started her artist career on YouTube in 2007, where she posted casual acoustic cover songs on the platform. Over the years, she has gained a humble following through her YouTube channel as well as coffee shop and university performances. Today, AILEEN hopes to bring her music to the next level—as she hones the skill of music producing, AILEEN hopes to create chill, soulful, or funky music with an electro/indie vibe, similar to the likes of Kimbra or AlunaGeorge. Listen to AILEEN's music on her YouTube or SoundCloud. AILEEN's average fan is a Californian teen girl who loves the surf the web—she's social media obsessed and spends most of her time on YouTube, discovering new artists and vloggers to watch. Because she's also interested in beauty and fashion, she spends a lot of her time browsing Tumblr, Pinterest, Chictopia, Lookbook, and various fashion or entertainment blogs. AILEEN's music and character resonates with her because she loves female vocalists who encourage female empowerment, independence, and strength. She is also inspired by such female artists who experiment with their creativity through art and music. Teens who love Fashion, Beauty, Video, Photos, & Online Communities.